"Kids familiar with the original tale will find much to enjoy in these unexpected twists and turns." “Wilson's plot is sure to entertain, but it will also resonate on a deeper level with anyone who has felt envious of a new friend, sibling, or pet." "Fun - and with a supportive message for readers who march to different drums." “A great addition to any school library." "Should spark the imagination and playfulness of readers both young and old!" "With an important message, creative formatting and lovely pictures, The Sinking of Captain Otter is a great picture book to have in collections. Highly recommended." "Sibling rivalry has never been so entertaining.... A winning combination of both smart and funny." 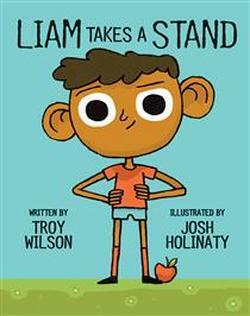 "Liam Takes a Stand is a winning read-aloud choice." "Readers will find much to appreciate in this unique take on sibling rivalry and competitiveness." "Budding entrepreneurs and readers with rivalrous siblings are bound to find it entertaining." 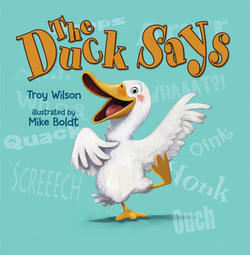 "Clever wordplay abounds in The Duck Says by British Columbian author, Troy Wilson.​...This storytime crowd pleaser will have children saying 'Read it again.'" "The Duck Says is a highly entertaining, laugh-out-loud, story." "Both the story and the art are sensational. I hope it sells a gazillion copies. Excelsior!" "An inspirational story with sly humour." "A wonderfully uplifting story for young and old."